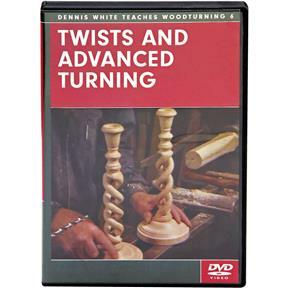 Twists, especially double or barley, have always intrigued woodturners, and they still do. Twists and Advanced Turning demystifies the techniques necessary to create these beautiful pieces. White explains, with great clarity, the method of turning single-tapered, double-tapered, and hollow twists. DVD.Note: Due to their nature, DVDs are non-returnable. Defective DVDs will be replaced. Twists, especially double or barley, have always intrigued woodturners, and they still do. Twists and Advanced Turning demystifies the techniques necessary to create these beautiful pieces. White explains, with great clarity, the method of turning single-tapered, double-tapered, and hollow twists. DVD. Note: Due to their nature, DVDs are non-returnable. Defective DVDs will be replaced.